Would you rather have a heavy breakfast? Or a heavy lunch? Some people prefer to eat more on breakfast to start the day while there are some who would rather eat during lunch and start the day without eating anything in the morning. Breakfast should always be heavy and rich in protein and I think as the day progresses the food should be lighter and lighter only. If you check the entire nature, every other creatures focus on their breakfast right from the morning. There is a significance to it. First of all you are breaking the fasting of overnight and in that sense only it is known as breakfast and it has great impact to the body as well. Science and research also says that breakfast should always be heavier and should be organic and should be rich in protein, if you want to bring some taste you can alter a little bit but both nutrition wise and quantity wise it should be heavy because in the morning if you are taking proper breakfast it gets absorbed in the body very quickly and he power of digestion is also at its peak during morning time, that is why everything will be balanced if you are taking proper breakfast at proper time. 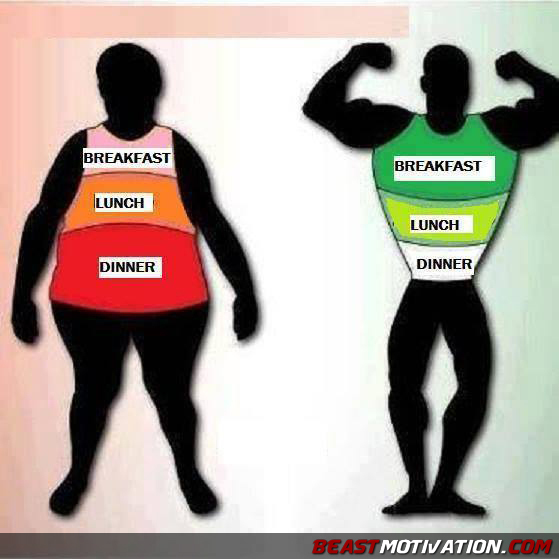 If you want to take lunch heavy as compared to breakfast you can do so but it will not be that effective as breakfast and in the evening or night either do not take food or if you are taking. then make it lighter otherwise it will add complexity to your body in terms of digestion. Further if you are not at all taking breakfast in the morning then it is harmful for your body because that is the time you must take something in your breakfast, if you do not intend to take it heavy and want to make it light, no problem, but not taking at all will have an adverse effect to you body. They say "breakfast like a king, lunch like a prince and dine like a beggar"? After 7-8 hours of sleep, during which the brain has not rested (and yes it works even when we sleep), it is essential to break the fast. At breakfast, the brain prepares for cell repair work the next night. Hence the interest of eating proteins and lipids in the morning. Dopamine, the neurotransmitter that gives us the peach is active in the morning, and its synthesis by the brain requires that we swallow protein and a cocktail of vitamins and minerals. To put it simply, if you do not have breakfast (or not enough "energetic"), do not be surprised to be flat at 11am! Neither. A light nutritious breakfast and a light nutritious lunch. No need for heavy meals. They just make you sluggish. For me I would rather have a heavy lunch because I always wake up very late and I need to work so I don't have any time to have a breakfast. I always have bread and coffee in the morning so I make it to the point to have a heavy lunch and of course I have one hour break so my mom would always cook my lunch . :) I like eating rice and a dish too . :) I prefer to eat fried foods and soup at the same time . It is usually hot in the afternoon so eating with cold drinks is the best for me . I think breakfast as I don't normally eat brskfast or lunch. I have very bad eating habits and have for a long time now. I know I should have something in the morning besides coffee but I forget and by lunch I am too busy. This is something I want to change and any breakfast would at least be something. I every now and again have breakfast but that is more of a treat. They say: "Eat breakfast like a king, lunch like a prince and dinner like a beggar". This is what they say although if you ask me, I don't agree. I prefer to have a light breakfast, which is mostly oatmeal with yogurt or sometimes fruits, a smack at like ten am, a heavier lunch but not too heavy, then maybe a snack if I'm hungry and dinner, but something light, not too much. I've been skipping breakfast for years because it felt good to have a coffee in the morning and nothing else. Now I know it's been foolish. English people have English breakfast, which means bacon, sausages, eggs and tea or coffee. I've had that for a week and if was ok because I was walking the streets all day and had the energy, not to mention that it was the only meal that was paid for, but I'm not a huge fan or it. it's too heavy, too much calories. If you don't burn those calories, you're in trouble. The truth is, your body is like an engine, it needs fuel to function. Some people skip breakfast saying they are not hungry. That's not wise, it's not recommended. You should balance your food intake so you can avoid hunger and overeating. Can you bring food in your suitcase on a airplane?Technical Steem question, how do you convert SBD to STEEM?What do you think is the first priority Musing should add/improve?DOES your pet dog eat fries?What is the hardest battle one can ever face? ?What do you believe is the best form of government?Why does the rainbow have just seven colours?What are the qualities of a true friendship?Is there an official announce to release SMT?How much of your money can you comfortably put in steem?